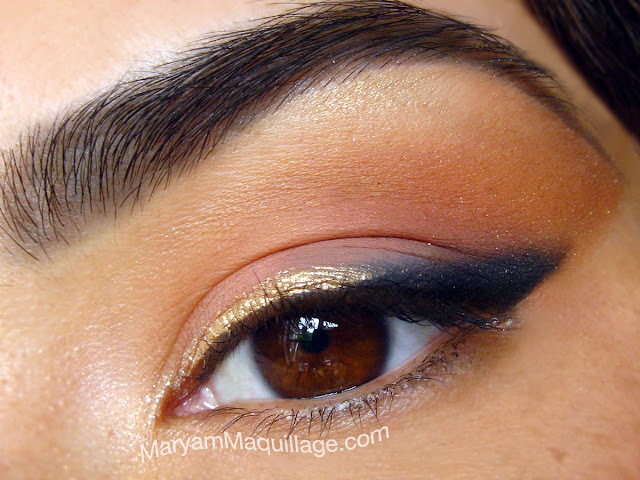 Maryam Maquillage: Bronzed and Dinair-Brushed! 2. Complexion: To create a flawless sun-kissed glow, I mixed one drop of Light Bronze with my custom mix of Honey Beige and Dark Golden Beige (equal parts) and sprayed the foundation evenly all over my face. The 1/10 shimmer of Light Bronze is very subtle, resulting in a dewy, glowing canvas. Next, I sprayed Peach Pink on to the apples of my cheeks and followed by contouring with Bronze Rose. I finished off the skin with one drop of Gold shimmer down the bridge of my nose and the tops of my cheekbones. Eyes: To begin my smokey cat eye look, I sprayed the remainder of Peach Pink onto my lid, staying under the crease. I followed by defining the crease with Bronze Rose, spraying the colors about 1-2 inches away from my eye. Using a Dinair brow template as an eye shield, I created a sharp edge at the outer corner up to the brow by spraying Light Bronze as a blending color. I also used it to define my eye with Jet Black eyeliner color. Placing the brow template / eye shield right above my lashes, I sprayed directly onto the shield to create a sharp edge at the bottom and a diffused smokey edge at the top of the eyeliner. I love this technique so much that I decided to extend the line some more. To finish off the look, I sprayed some Barely Pink to the inner corner of my eye and some Gold directly under my eyebrow to create a highlight. My next step was to clean the airbrush, but before I did, I decided to line the top lash line with a q-tip that I used to clean the makeup cup after Gold. Talk about not wasting a single drop!! Eyebrows & Lashes: I used the brow template and the remainder of Jet Black in my makeup cup to fill in my brows and lashes. Although the widest template didn't exactly fit my thicker eyebrows, I moved it around to create my perfect shape. Since Jet Black is too harsh as an eyebrow color, I sprayed about four inches away to diffuse the color. I think I got away with it, because my natural eyebrows are indeed black. And here's the finished maquillage. Can you believe the whole look was completed using only one tool? Yup, that's why I'm addicted to my Dinair Airbrush System. Check out my original review of the Dinair System and follow them on Facebook and Twitter to be one step closer to being flawlessly Dinair-brushed! *This product was sent for my consideration and review. I was not compensated for this review and the information stated is 100% my own, uninfluenced and unbiased opinion. I am not affiliated with Dinair. wow! I didn´t know that you can do all your makeup with it! Amazing! Love the mix of gold and navy on your eye!!! I didn't recognize you, you looks more like a doll? Beautiful!!!! Your skin looks flawless! You look gorgeous! Wish I had the spare change to splurge on this! thanks love!! and I hear it, it's not cheap... BUT, it is soooooo worth it!!! You finally found a way for your makeup to be as flawlessly beautiful as you are! Gorgeous! Wow I can't believe this is all done with the airbrush system! Awesome! I really like how natural yet polished your lips look, very pretty! Hi Maryam! It's fabulous! I love the natural, but perfect and detail look! Have a nice time and see you soon. Xoxo V.V. wow you're so amazing!!!! love this entire look!!! Wow, it looks flawless! I feel like it would be so difficult to do such a precise eye look! Wow hon you are so wonderful at this! I wish I owned an air brush system. You look gorgeous! So pretty. I love the gold and navy together! You look gorgeous hun..I love it..Never try any air brush before..Seems flawless and you can't tell that your using air brush..
You are becoming an airbrush pro!! The fact you did everything, *including* your gorgeous eye makeup, using the Dinair is insane, because it looks PERECT!!! just gorgeous, natural with a little flare. love it! ahaha, yes, I'm a beach junkie myself lol can't wait till the summertime :)) thanks love!! 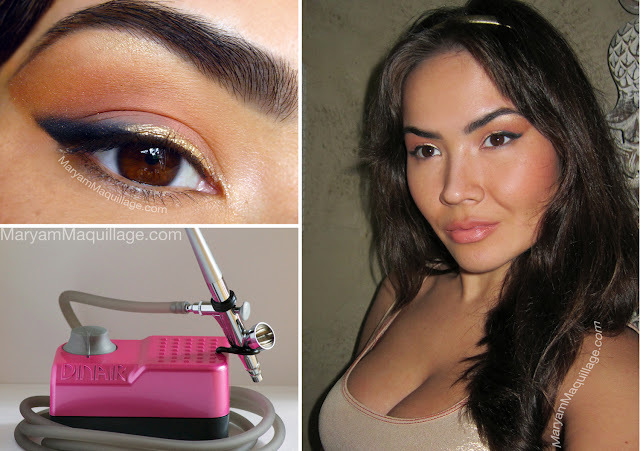 You are so awesome at using the airbrush system - I can't believe your whole look is airbrushed, it looks amazing! Love how you created that sharp edge cat eye look. The eyes are amazing, Maryam!!! You have amazing eyebrows. That might be a strange compliment, but it is totally true. I'm sooo curious about airbrush makeup,I really need to try it! I love your makeup and your hair down. Get em girl!! Super duper gorgeous. beautifully natural, and will only airbrush, very cool! <3 I'm so glad you've really gotten the handle on this - you and your results are beautiful! awwww..you are so beautiful and your brow are perfect! "The finished Maquillage" is really flawless, smooth & sensuous,sparkling & splendid & like a beautifully bronzed & well sculpted goddess. Maquillage -you are far from finished: You have miles & miles to go ! hahaha, thanks Ram, you're awesome!! and.. Your MakeUp is Amazing !!! So pretty with the gold touch! gorgeous look! btw I give you Tell Me About Youself Award! i have wanted to try airbrushing but never got there haha! must take time to read more about it though, so thansk for this post! I reeeeaaally want to try airbrushing! I just wanted to thank you for post. I have a dinair system, too and I love it! I'm been contemplating getting the airtan for about a month or so now and I've been searching and searching to find someone, anyone that has positive things to say about the airtan before I pluck down the $ and order it. So, thanks for your endorsement. That's all I needed to finally pull the plug. However, are there any further tips you can give? How long does it last for you? How does it fade? Does it get splotchy at all? Btw, can't believe your eyes! I love doing my eye make-up with dinair but I haven't gotten that good yet! I cannot believe you air-lined your eyes - that's brilliant!! !